Hi crafters! 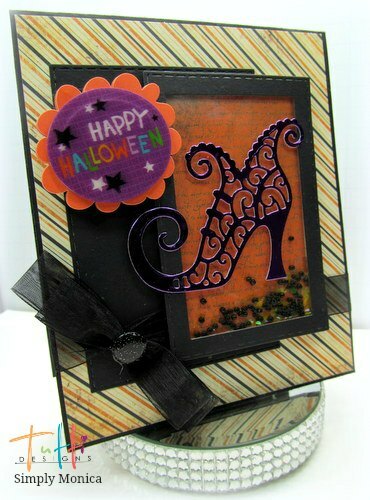 Today I am sharing a Halloween card I made using Tutti Design die "Witch Shoe"
First, I used Tutti "Nesting Stitched Rectangles" to create an frame by using 2 of the dies together as seen in the photos above. I then added some foam tape to the back of the frame and added a piece of acetate to my frame. I then added some mini beads and glitter for a shaker frame. Next, I cut the witch shoe from some purple foil paper which makes it pop off the paper more. To finish it off I added a bow to my card front and a sentiment to finish the card off. I hope everyone enjoyed my card for the day. *Tutti Tip: Create a frame with your dies by layering to dies on the same sheet of paper. Now be sure to check out the Tutti links listed for you below. WOW! This is just amazing Monica! I LOVE it!! Thanks for fabulous inspiration! Fantastic, Monica! I love this shoe die cut.